The EU, in the meantime, took nine days to launch a "donors' conference", the start of grotesque bidding process which had different nations vying with each other to be seen as the most generous. In the immediate aftermath of the tsunami, president Bush pledged $35 million and then, under pressure from the media and other nations - to say nothing of the United Nations, which accused the US of being "stingy" - increased contributions to $350 million. However, the EU sought to learn from the experience and has since attempted to enhance its capabilities. But, despite multiple initiatives to reinforce the EU's "emergency and crisis response capacities", all the EU could manage this time by way of immediate response was to hold a Brussels press conference led by Commission Vice-President Baroness Ashton, now the EU's High Representative – our new foreign minister. This lacklustre response was noted by Booker in his column yesterday, who recorded how a scattering of bored-looking journalists in the Commission's lavishly appointed press room heard the former head of Hertfordshire Health Authority stumbling through a prepared statement, in which she said that she had conveyed her "condolences" to the UN Secretary-General, Ban Ki-Moon, and pledged three million euros in aid. Despite the pretentions of the EU in building a rapid reaction force to deal with disasters, that was never going to come to much. But in its development aid – alongside the UN – the EU prides itself in being the world's leading contributor and a champion of third world development, standing in the forefront of fund-raising efforts. Within hours of Port-au-Prince crumbling into ruins, the US had sent in an aircraft carrier with 19 helicopters, hospital and assault ships, the 82nd Airborne Division with 3,500 troops and hundreds of medical personnel. They put the country's small airport back on an operational footing, and President Obama pledged an initial $100 million dollars in emergency aid. Yet, despite the tranzie's enthusiasm for collecting huge sums of money, very little seems to have been learned from the tsunami experience. A year after disaster struck – with $13 billion of aid pledged – much of it was unspent. Two years later, the situation was much the same, in what amounted to a running scandal. By 2007, there were calls to re-allocate the unspent funds. Despite all this, the most "constructive" idea the EU has had to date is to call for an international conference. Yet Haiti has already had its fair share of such conferences, the latest being a donor conference, held in April 2009. This was organised in the aftermath of four devastating tropical storms. 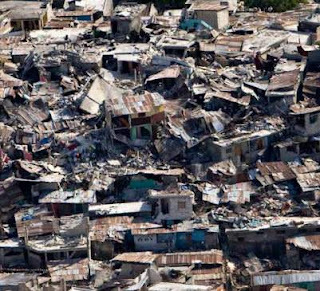 At the time, there were peldges of $324 million over the next two years, short of the $900 million Haiti's prime minister said he needed, but the sum later increased to $760 million. However, by November 2009, only $21 million had actually been disbursed. Some of the problem has been that much of the UN's efforts have been devoted to climate change – even in the context of disaster relief. And such is the obsession of the EU with the issue that its efforts on disaster relief have been similarly focused.